The territory of Bassae is located between Arcadia, Triphylia and Messenia, on the western slopes of Mt. Kotilion near the ancient city of Phigaleia. The mountain is scored with ravines (vassai), which give the place its name. In this bare, rocky landscape, 1131 metres above sea level, the people of Phigaleia founded a sanctuary in honour of Apollo. A sacred road connected the sanctuary with the city, nearly thirteen kilometres away. The sanctuary was dominated by one of the most imposing monuments of ancient Greece: the temple of Apollo Epikourios, whose cult was established in the late eighth-early seventh century BC. The god was given the surname ‘epikourios’, either because he was thought to have helped the Phigaleians in their struggle against Sparta in 659 BC, or because he prevented the plague from spreading during the Peloponnesian War. Apollo is also named ‘vassitas’ in an inscription from this site. The history of the sanctuary at Bassae is linked to the military activities of Phigaleia and to the continuous struggle between Arcadians and Spartans. The former always sided with Messenia in its wars against Sparta. The site was occupied first in the Archaic period. The earliest temple of the sanctuary was built in the late seventh century BC and a small settlement grew up around it. It is possible that many Messenians found refuge in Bassae after fleeing their homeland following the Spartan victory of 650 BC. Many votive offerings from this period were found in the topsoil around the temple. They include terracotta vases and figurines, metal figurines of humans and animals, jewellery, the tortoise-shell sound box of a lyre and many weapons, both real (made of iron) and votive (made of bronze). The offering of weapons may indicate that in the sanctuary’s early years Apollo was worshiped primarily as a war god. Traces of metalworking from the Archaic period were also discovered near the temple. Although the temple’s pre-Classical building history is uncertain, it is probable that the Archaic temple was reconstructed at least once or twice between 600 and 500 BC. Several architectural pieces belonging to these phases were uncovered on the site. 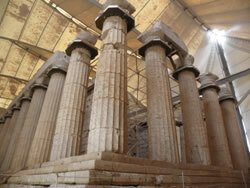 The surviving Classical temple by Iktinos was built in approximately 420 BC. The ancient quarries that provided the building material for the temple were located to the north and northwest of the site. Artemis and Aphrodite were also worshiped in this area, in a separate sanctuary on the highest peak of Mt. Kotilion. Demetra, too, was worshiped here, although her sanctuary has not yet been identified. The sanctuary at the top of Mt. Kotilion was probably founded by poor Phigaleians living in Bassae. Its temples were abandoned in the third century BC, unlike the sanctuary of Apollo, which remained in use in the Hellenistic and Roman periods, as shown by the stamped tiles used for repairing the temple roof. Pausanias visited the sanctuary in the second century AD and described the monuments and their history (8, 41, 7-10), particularly that of the temple of Apollo. In subsequent centuries the sanctuary was abandoned and severely damaged by earthquakes. The space, isolated and inaccessible, it remained abandoned until the 18th century, when it was identified by French architect J. Bocher. Since then many famous travelers visited the Vasses and in 1812 became the first excavations of antiquities group of scientists, who obtained permission from the Veli Pasha, Turkish commander of the Peloponnese since that time Greece was enslaved by the Turks. Then they found 23 plates from the inner frieze of the temple, unique masterpieces of sculpture, which were transferred to other parts of the sculptures from the temple on the coast of the Ionian Sea and from there to Zakynthos. monument in the history of ancient Greek architecture. Pausanias, indeed, considers him second after the Peloponnesian Tegea temple in beauty and harmony (8.41.8). Its construction was placed at 420-400 BC.